Already a Green Room Member? Click Here to Log In…. ...and the way that they ONLY concentrate on the records and family trees, with no explanations or help on hand. How easy it is to run into a brick wall - especially with complex Irish Ancestry and Genealogy. Well, The Green Room is run by Irish people, out of Ireland - and only focused on Irish ancestry research. We know Irish culture, history, the language - and many of the issues people have with understanding complex Irish Heritage and Ancestry. While genealogy record sites bring you part of the way - we'll bring you all the way home! If you like Mike & Carina Collins and their weekly "Letters from Ireland" - then you will love the Green Room. Friendly, helpful, knowledgeable and all-Irish! 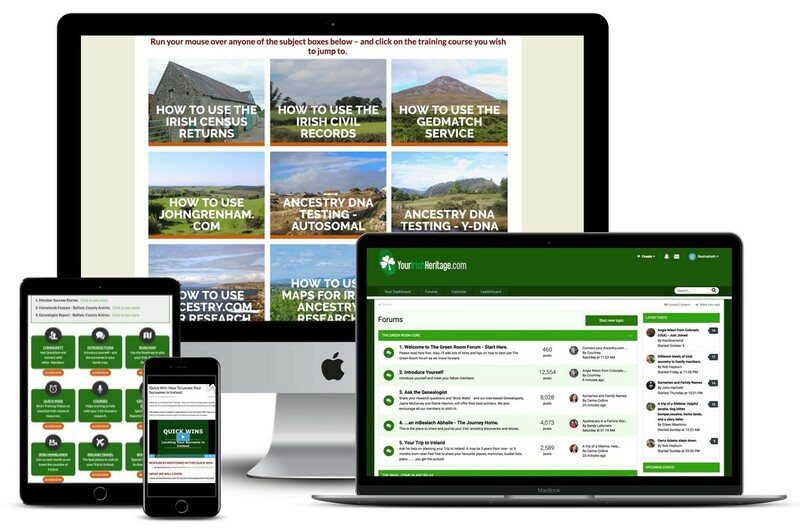 The biggest feature of [The Letter from Ireland] is The Green Room, a subscriber-only area that gives users access to video tutorials, e-books and a forum where they can discuss their research with genealogy experts. Let us help you Bring Your Irish Ancestry to Life! ​You are already joined a site like Ancestry.com - but now want to really break down those frustrating Irish ancestry "brick walls". ​You have gathered as many facts and details on your Irish Ancestry as available - you want more information, but you also want to explore what life and times were really like for your ancestors. You are planning a Trip to Ireland in the next 18 months - and you want insider help with your planning and choice of places to visit. I have had another thrilling find this week following one of Mike's research methods shown in the training. I was just fascinated with all that Mike and Carina were able to find about my family that I could not locate in ten years of genealogy. Use our unique step-by-step Irish Ancestry Research Roadmap to guide you through everything that you need to do at any stage in Your Irish Ancestry research. Keep track of your progress and avoid overwhelm by always knowing what you should be focusing on. And when you need to - just jump in and ask our Genealogist a question. 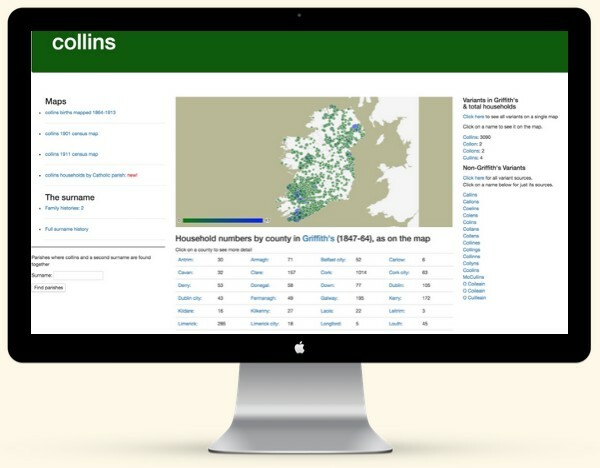 ﻿Connect with over 1,880 other Green Room members who share your passion, Irish surnames and heritage. Ask questions and share discoveries. Easy-to-use video training on Irish Research tools and DNA testing. Quick Wins and in-depth training included. Access to our in-forum Irish-based Genealogist to give you pointers and help with your "brick walls". We also commission special genealogy reports for selected members. All our Green Room members get FREE annual membership of JohnGrenham.com - Ireland's foremost Genealogy record site. Free Ancestry Books to download, research resources and other offers to help you with your Ancestry search. 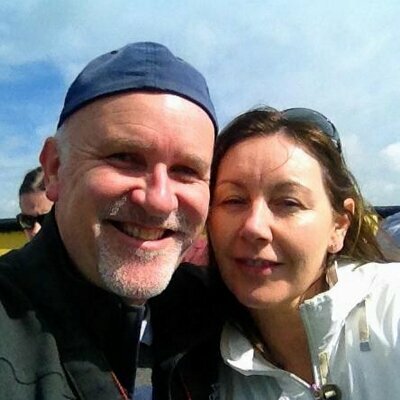 I have learned so much from your site about genealogy in general and Irish genealogy in particular. Get Instant Access to The Green Room! Recurring payment every 3 months - cancel anytime. Hassle-free 30 day money-back guarantee. Recurring payment every year - cancel anytime. JohnGrenham.com ﻿is﻿ the #1 authority site on Irish surname locations and Irish ancestry record sources. You get ﻿﻿﻿FREE﻿ ﻿ACCESS﻿﻿﻿ to Johngrenham.com (normally costs $80 per year) for as long as you remain a member of The Green Room! Mike and Carina you have a wonderful gift of being able to make people’s family ancestry come to life with your wonderful videos etc. Many of us have trouble finding a link to our past, but this site takes you closer to your roots without the actual record, and gives a sense of being with our ancestors. Do keep up this wonderful service. When you join The Green Room, you are fully protected by our 100% satisfaction guarantee. If you don't feel like you've received value and you decide you want to cancel any time within the next 30 days, just let us know and we'll send you a prompt refund. No hassles, headaches or hoops to jump through. "We're so confident that you'll find the Green Room useful that you have 30 days to change your mind. If you're not satisfied within your first 30 days then we'll refund you without any fuss." I'm just starting my Irish ancestry research - is the Green Room is right for me? I'm quite advanced in my Irish ancestry research - is the Green Room is right for me? We certainly feel that the Green Room is ideal for more advanced Irish ancestral researchers - and we have quite a few in our community. They often take advantage of our resident Genealogist - and test her knowledge and direction all the time. If you join and feel the Green Room is not for you, feel free to request your membership fee back within 30 days after joining and we will be happy to oblige. However, we do think you'll be pleasantly surprised! Immediately! You will receive login details and instructions following payment. New content is added regularly so you'll never be short of something new to learn! We have a wealth of great content already and you have the chance to put forward your own ideas too if there's something you really want to see added. Can I get one-on-one help for my research? You can you ask questions and get advice, support and feedback from within our community - feel free to ask for specific feedback and assistance from our resident Genealogist, Mike and Carina or all of our members. The only thing we ask is that you ask your questions openly within the community so that all members can benefit from the answers and suggestions supplied. I'm not great on computers - is the Green Room hard to learn? All new things take some time getting used to! However, we have laid out the Green Room to be as easy as possible. Also - there are videos to "show you how". And, if you get stuck - just call on Mike! No. While you remain a member, your membership fee will stay the same and never increase. I have no money - Can I still join The Green Room? We have lots of great FREE content on aletterfromireland.com, our weekly Letters from Ireland and Facebook page. Green Room membership is a paid experience. Your choice! What if I don't enjoy The Green Room? We know you will LOVE The Green Room. However, if for whatever reason you're not 100% satisfied in any way we have a 30 day money back guarantee (no questions asked). We want you to succeed, and know that if you become a member of the Green Room and really put an effort into it… you will see great results! Obviously we'd love it if all of our members stuck around forever - but we realise that's not always going to happen! So, if you do decide to cancel obviously we'll be very sad, but if you're intent on leaving then you'll be able to do so with just a few clicks of a mouse. Can I access the content released in the Green Room during my membership once I cancel? No. Your membership entitles you to enter the members area and access the content there released prior and during the duration of your membership. If you cancel or do not renew your membership you will no longer be able to access the content inside the Green Room. If there is anything at all that you're not certain about, anything we haven't made clear; any concerns or questions then please do contact us as support@youririshheritage.com and we'll help you out. Your thorough methods are great and the explanations are all clear and concise. The time and effort you put into your research for all of us is amazing. For myself who lives in Canada it brings Ireland just a little bit closer. Thank you so much. Thanks again for all the wonderful information about my ancestors and the areas in which they lived. You and Carina are most skilful genealogical and Irish history researchers.